In the past few posts, I’ve talked about starting The Hacker’s Diet, counting calories with Lose It!, and graphing my weight with True Weight. Now I’m going to switch over to talking about exercise. I read Wired’s “Live by the Numbers” article on Nike+ just as I was starting the diet, and, apparently being in a fairly suggestible state, decided to try it out. Exercise is good for periodically burning a chunk of calories (with Lose It! there to ensure that I don’t eat even more to compensate) but better for overall helping me become a healthier person. Do not just put on a pair of shoes and start running. Do not try to match pace with Andrew W.K. songs. My friend Leah tipped me off to the idea of using a program of gradually-increasing intervals instead. There are a handful of these available, but a fairly popular one seems to be Cool Running’s Couch to 5K. Couch to 5K is a nine week training program, three days a week, the last week of which is 30 minute runs (which, if you’re a bit faster than me, will be five kilometers long). The first five weeks are 20 minute workouts that alternate between running and walking (3 minute walk, 90 second run, &tc.) in order to build up one’s stamina. Timing these manually can get to be a bit annoying, but, luckily, as they say, there’s an app for that. 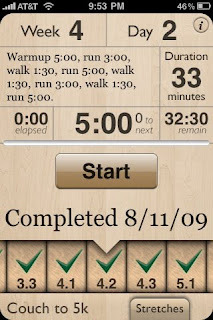 Felt Tip, Inc.’s Couch to 5K app [itunes store] is the very one. It has Cool Running’s routine programmed in, and, if you keep it in the foreground as you run (you can lock the screen), it will play audio cues for when you should switch between walking and running and vice-versa. It also times your warm-up and cool-down walks. I found this app attractive (Why wood? I don’t care. I like it.) and very functional. Owing to limitations in the iPhone platform you must keep it running with music playing and the ringer switch on ring for it to time and play its audio, but I didn’t find that much of an inconvenience. Couch to 5K is nice enough to start exactly where you left off if you accidentally quit it by bringing up a different app. Since Apple can circumvent its own rules, you can use Couch to 5K along with Nike+. Nike+ will happily operate in the background, so just start it first, then Couch to 5K. 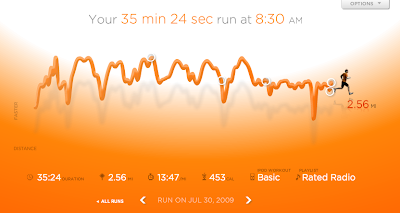 I ran both simultaneously for the first several weeks, but got a bit annoyed at Nike+’s lack of sophistication. Since it has no concept of warm-up or cool-down, you would need to pause it to keep those sections from bringing down your run’s average pace. I just sort of didn’t bother. It was neat to see the intervals graphed out, though. I just wish I could mouse over the graph to get the pace at that point; Nike+’s site is not the numbers-geek paradise Wired claimed. Now, since I’m in to the constant-running weeks (just started week 9), I don’t use the Couch to 5K app during the run at all. I know a spot that takes me five minutes to walk to, so once I get there I set Nike+ to the week’s duration and take off. The app nicely lets you check off days (with a double-tap) if you complete them outside of the app, so I can still keep track of my progress there. Running’s great, but so’s walking. Nike+ can get confused if you mix them, so that means that there’s another app to talk about next time.